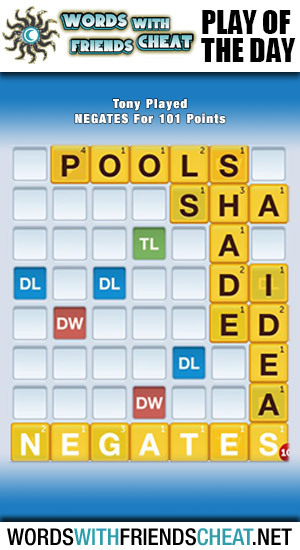 Today’s Words With Friends – Play Of The Day is NEGATES (101pts) and was submitted by Words With Friends Cheat user Tony. Tony dropped this fantastic word on top of two triple letters and a triple word to seal the deal. He also emptied his entire rack earning him a thirty five point bonus. His use of the triple word tile connected his already solid play to IDEA, earning him triple the points for two separate words.